Adding notes, emails and alerts. The notes section can be accessed from any claim by clicking on Notes. This is an overview of the notes area. 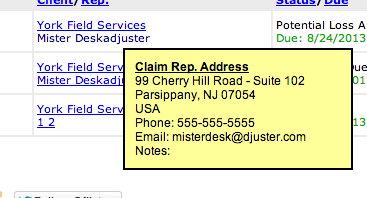 This screen pops up in a seperate browser window when you click Notes from the Manage Claims screen. Previously entered notes can be viewed by scrolling down. The file number is always available at the top of the screen to ensure you are in the correct file. This is the main note area. Enter your note in the large blank box, if sending an email, make sure the note is formatted with a recipient and your signature. 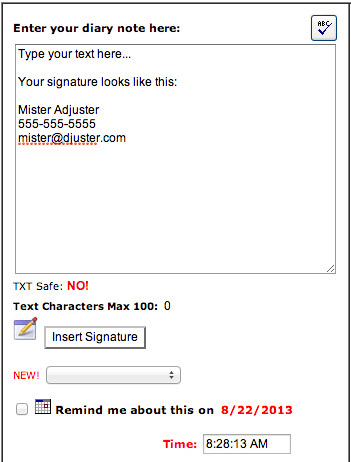 Clicking the Insert Signature button will place your signature in the box automatically. A clipping of pre-defined text can be inserted from the drop-down. You can also elect to have a reminder notification appear on your alerts page by selecting a date and time and checking the Remind me box. 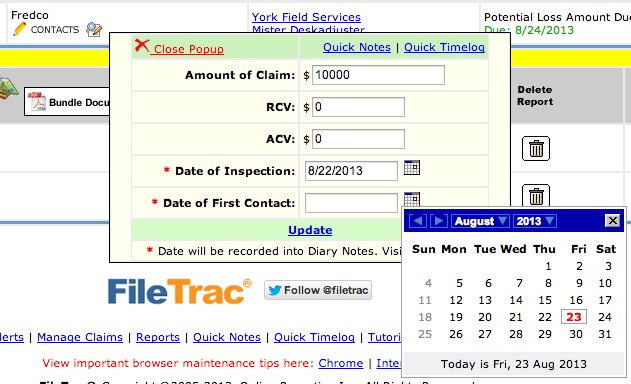 Our clients do not have access to FileTrac so there is no need to use this top checkbox. 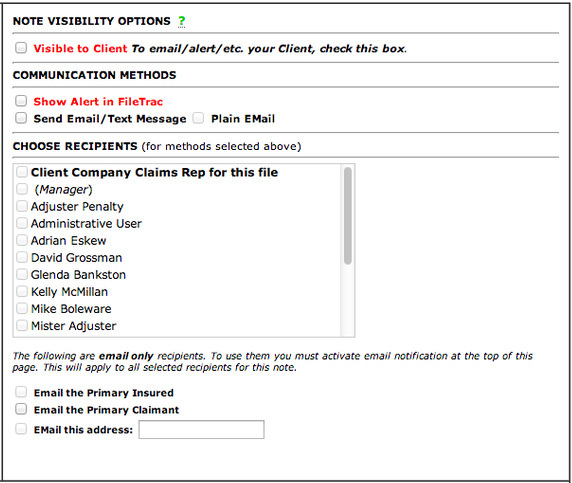 Select one or both of these boxes to either send an email or show an Alert on the recipient's alerts page. Any of the active support personnel on the file as well as all of the Quick Cat staff can be chosen as a recipient of your message. You can also elect to send an email to the primary insured or claimant, if in the system. Alternatively, you can enter one or several comma seperated email addresses in the provided box. Your message will not be sent or saved until you have clicked on either of the two provided Save Comment buttons. Sending a Report to Review. Once you have uploaded your report and supporting documents into FileTrac, you must alert your file manager so they can review and forward to the client. 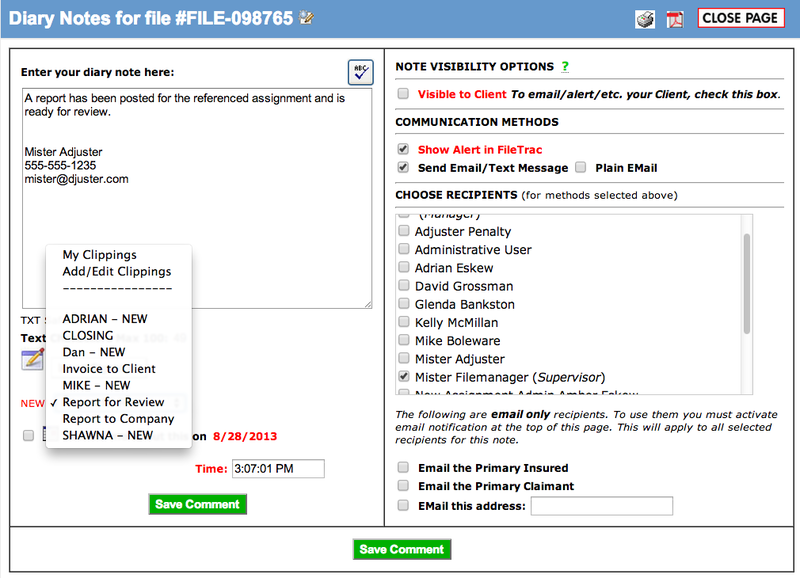 The quickest and easiest way to do this is by selecting the Report for Review clipping from the FileTrac Clipping drop-down, add your signature and then select the appropriate checkboxes for sending emails and alerts. Your File Manager (supervisor) needs to be the primary recipient. Make sure to click Save Comment.